Let's Celebrate With More Yarn! My online store, Gantsilyo Guru Selections, is preparing for a surge of yarn for the last quarter of the year! New yarn from Red Heart and Hamanaka will be offered for the first time (officially) in the country. 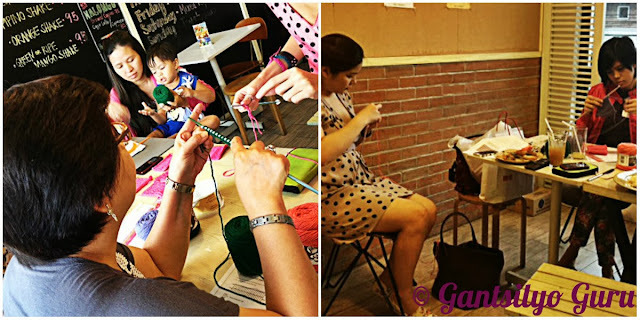 We will definitely have a (yarn) feast! 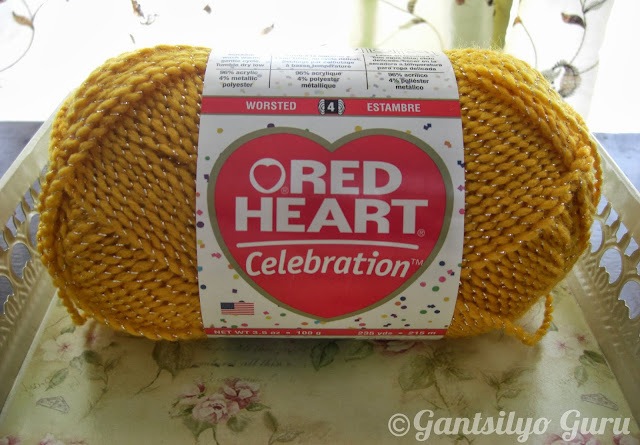 To kick start the introduction of our new line of yarn, we will be raffling off some of these starting with Red Heart Celebration Yarn! "Celebration yarn is a party in a ball! Bright fun shades with a touch of metallic are perfect for everyday and holiday projects that are sure to get noticed. 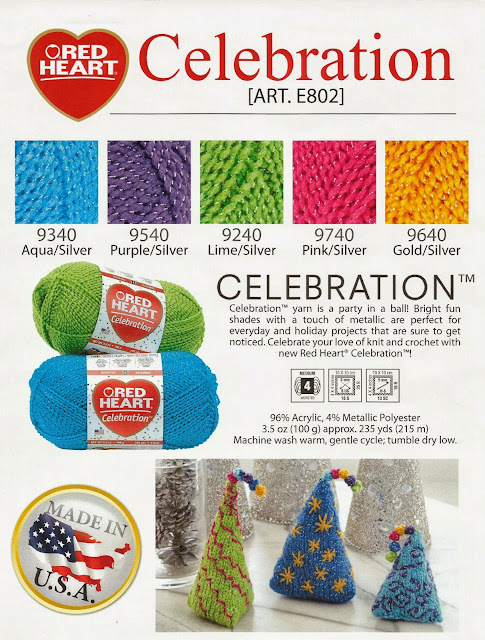 Celebrate your love of knit and crochet with new Red Heart Celebration!" This yarn is made of 96% acrylic and 4% metallic polyester. Yarn thickness is Medium Worsted (4). A skein of Celebration yarn is 100g and is 215m long. The recommended hook size is 5mm (US H8). You may also knit with this with the recommended needle size of 5mm (US 8). Of course, hook and needle sizes still depend on the required gauge of a project. The skein above is in Gold/Silver. Check out the other festive colors of Celebration Yarn that will be offered beginning October! 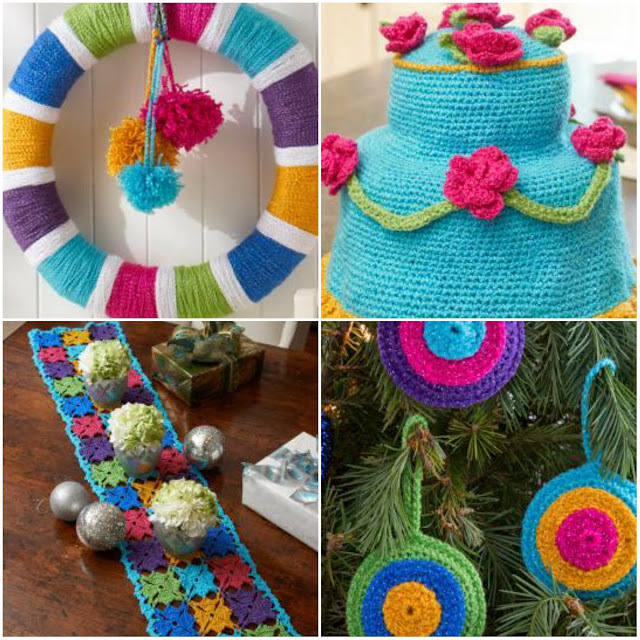 Here are just some of the projects you can do with Celebration yarn. All of these have free patterns from Red Heart! 1. Go to my Facebook Page, Gantsilyo Guru Selections. 2. Hit the "Like" button. 4. ...with the text shown below as part of your post for the share. 5. Make sure that "Gantsilyo Guru Selections" is the tagged link to my page. 6. Make sure that your sharing status for this post is set on PUBLIC. Setting the status of your share to "Public" will enable me to see your share. Without seeing your share, I won't be able to include your name in the raffle. Sharing for this raffle will end on October 31, 2013. A winner will be announced on November 1, 2013. This raffle is only applicable to residents of the Philippines. I wanted to experiment with the Ice Merino Gold Batik Yarn in Purple Pink Orange Lilac. 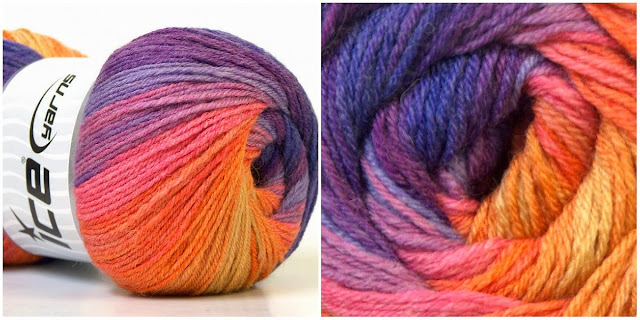 Clearly, the colors of this yarn are not for the faint of heart. I expected not so subtle transitions from one color to the next because of the hues of these colors. I got attracted to this yarn because of the bold statement the colors make. 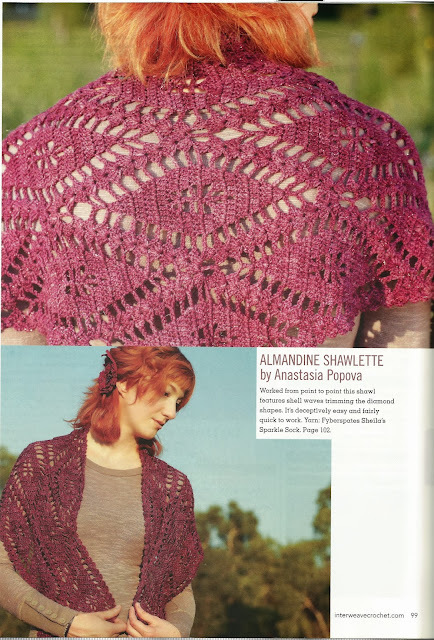 I decided to crochet a shawl using the pattern called "Almandine Shawlette" by Anastasia Popova. 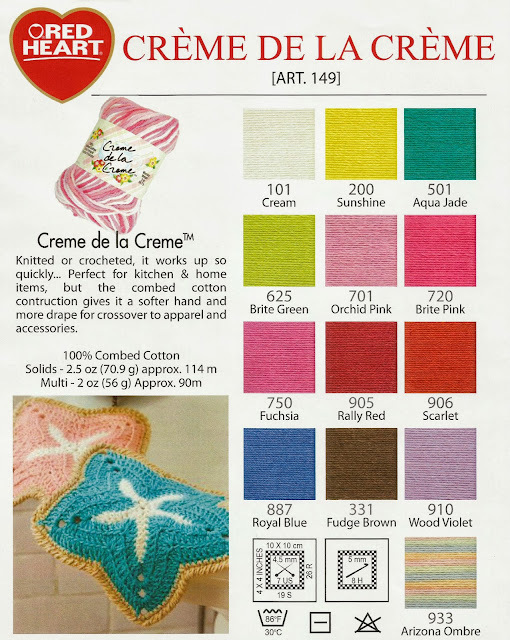 This was published in Interweave Crochet Accessories 2012. The yarn used in this photo is Fyberspates Sheila's Sparkle Sock made of merino, nylon, and stellina. It has the same yarn thickness - Fine 1 - as the Ice Merino Gold Batik, so it became the perfect substitute. Working with variegated yarn can make the process of crocheting amusing because of the color changes from one stitch to the next. I took this picture when it was still a work in progress. This is my finished version of the pattern. I used up 1 whole skein plus around 40-50% of a second skein of the Ice Merino Gold Batik yarn. I used hook 3.5mm (6/0 Japan or E4 US). 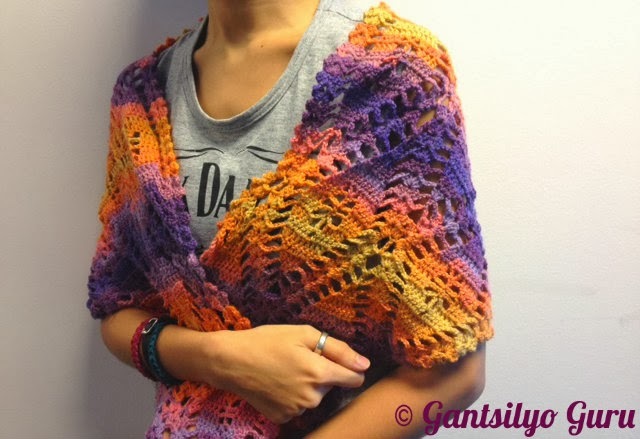 This is a shawlette, so don't expect a full-blown shawl that can cover your entire body. In terms of size, it might be between a scarf and a shawl. Check out the spread of this shawlette. The length from left to right is around 64 inches. This is the back. The variegation has a different effect from this side compared to the front. This shawlette can also be worn like a scarf. You don't have to go full on grandma wearing it like this. Wearing this shawlette can catch attention. If it can talk, it will shout :) I actually have a love-hate relationship with variegated yarn. Sometimes I like it, sometimes I don't. Honestly, the pattern of the shawlette itself can work without any variegated effect because the design already stands out on its own. Sometimes though, I get the urge to "destroy the peace" and create a different character for the project. I am accepting commissioned work for this pattern. A different yarn color may be used, depending on yarn availability. This shawl is also on sale. 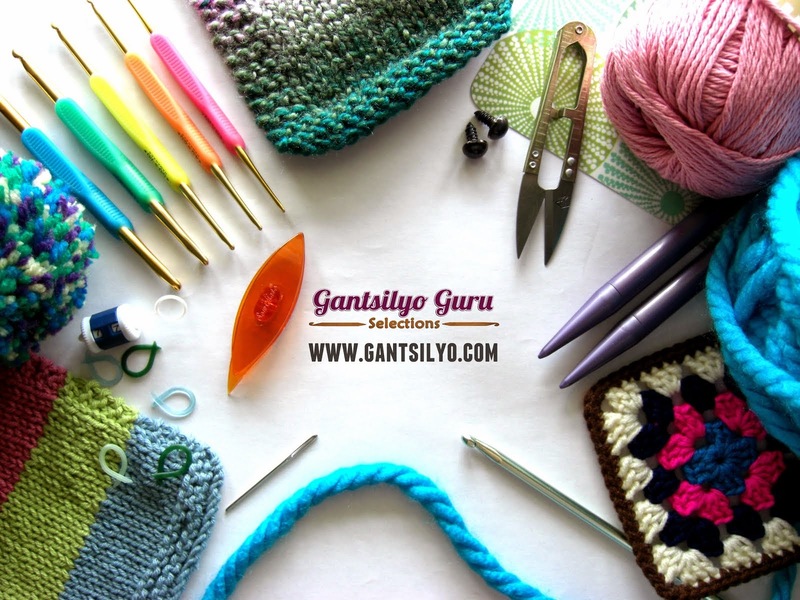 Kindly send me an email at gantsilyoguru@gmail.com or a private message at my Facebook Page, Crochet by the Gantsilyo Guru, if you are interested. Ice Merino Gold Batik is currently being offered at Gantsilyo Guru Selections in varying colors. 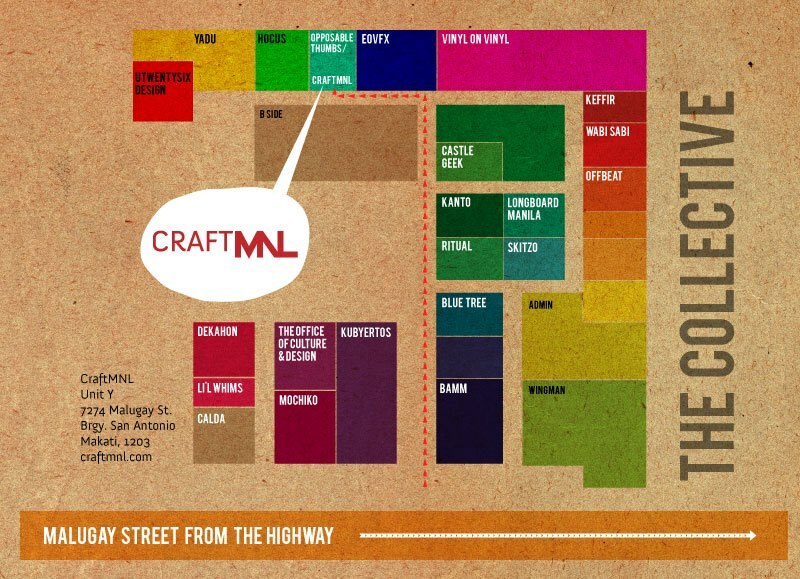 I will have a basic crochet workshop at Craft MNL on October 12 (Saturday) from 2:00 PM to 6:00 PM. 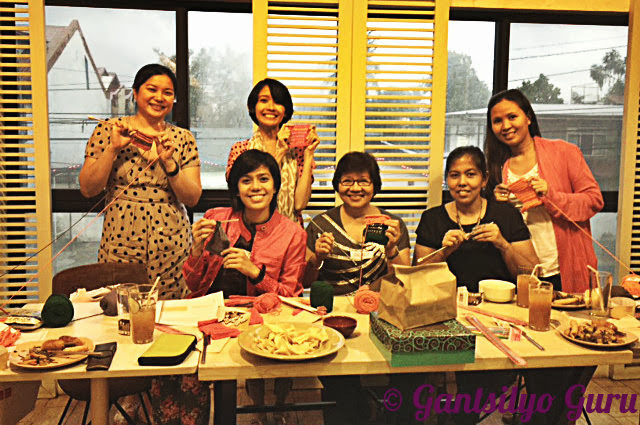 This workshop is for beginners and is a good introduction to crocheting. Workshop fee is P1,500. This is basic crochet 2.0! From 3 hours, the entire session is now 4 hours long to give participants more guidance on their crocheting. We have also upgraded our crochet kit! Each participant will take home a 6-pc. set of Susan Bates Silvalium Crochet Hooks, 4 different colors of Red Heart Super Saver Yarn (36g per color), and yarn/thread cutter. 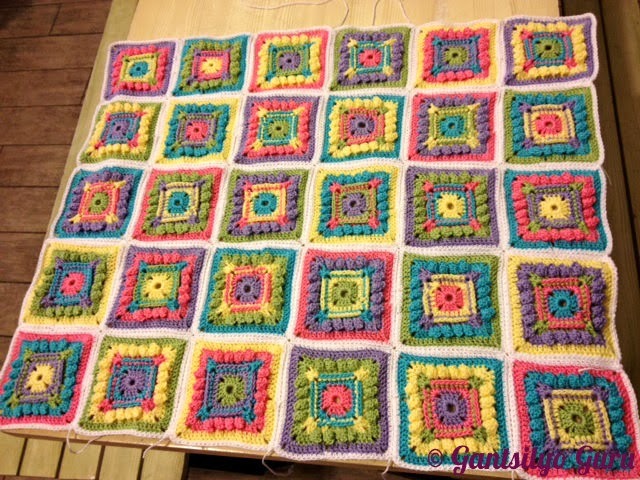 As seen on the poster, our goal is to make the classic granny square. 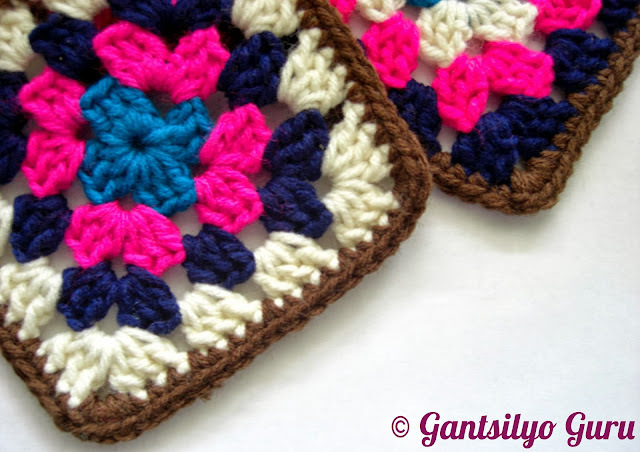 This is a simple but classic crochet motif piece that is friendly to beginners. 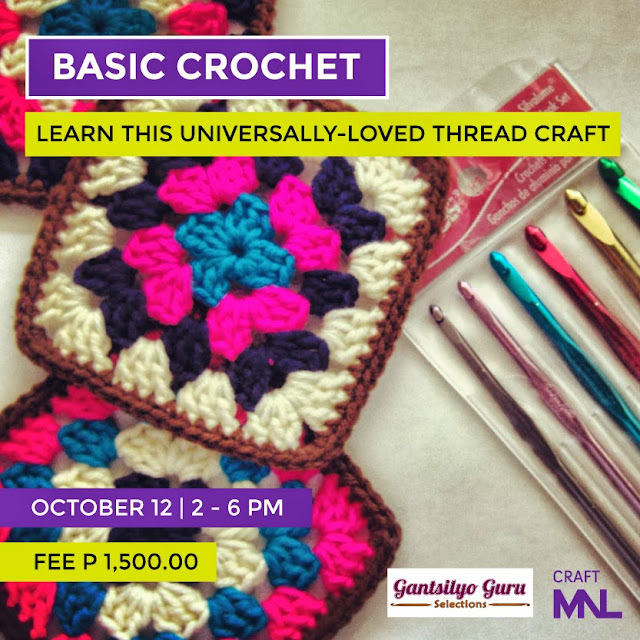 This is my only basic crochet workshop at Craft MNL in October. 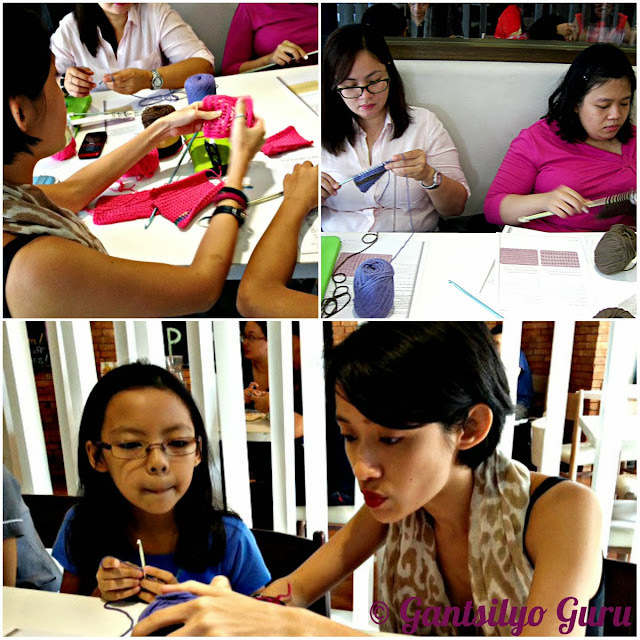 Check out some outtakes from a previous workshop at Craft MNL HERE. Only 8 slots are open for this session. To register for this workshop, please go to this LINK. Kindly note that in this particular registration via Craft MNL, you must click the "Add To Cart" button found at the bottom of the linked page. You must view your cart after and proceed to checkout. The process is like going through buying something in an online store. Payment may be made via Paypal or bank deposit. If you have questions on the registration, kindly send an email to hello@craftmnl.com. We had a full session last Sep. 14 for our Tunisian Crochet Workshop at Pipino Malingap. 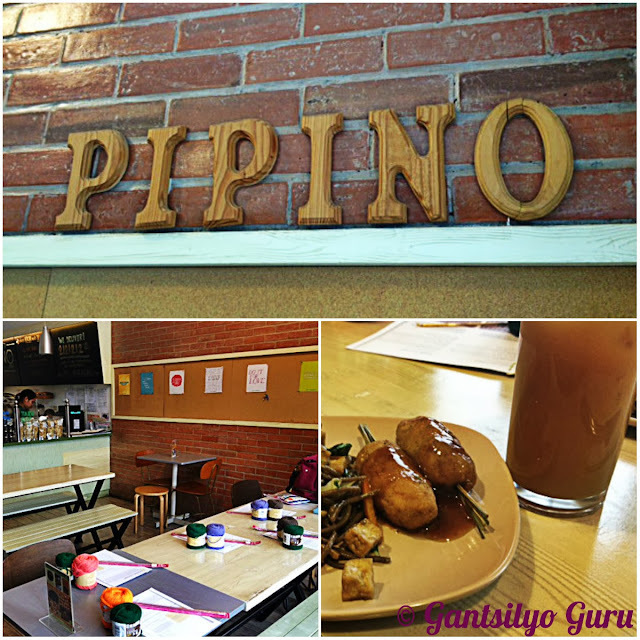 It's my first time holding a workshop in this branch of Pipino in Quezon City. 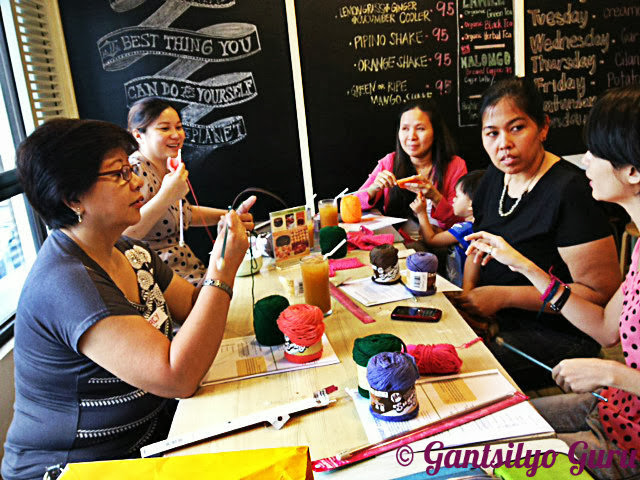 The place actually sends off a "crafty" vibe - no wonder why because Alessa Lanot of Life After Breakfast usually holds her crafternoons here as well! Great service too! Each participant had a platter of yummy Pipino vegetarian food served with in-house iced tea while they worked on their Tunisian stitches. 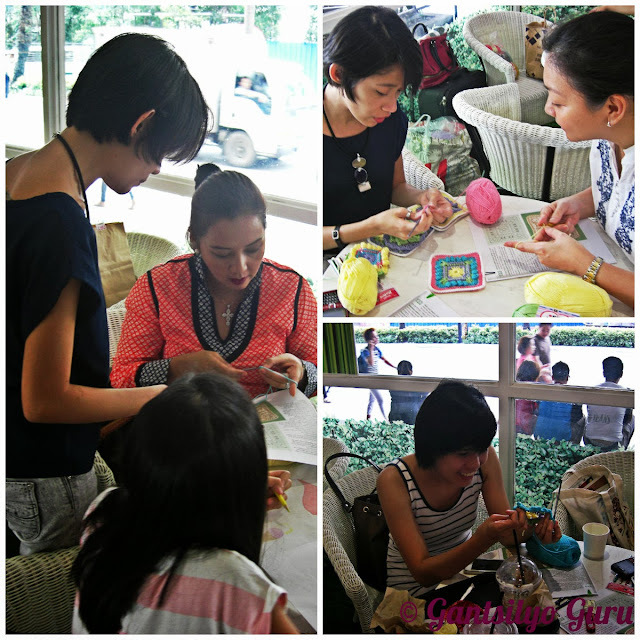 We had first time crocheters and experienced ones in the mix. We learned 4 different kinds of basic Tunisian stitches using the Susan Bates afghan hook and Lily Sugar 'n Cream yarn. 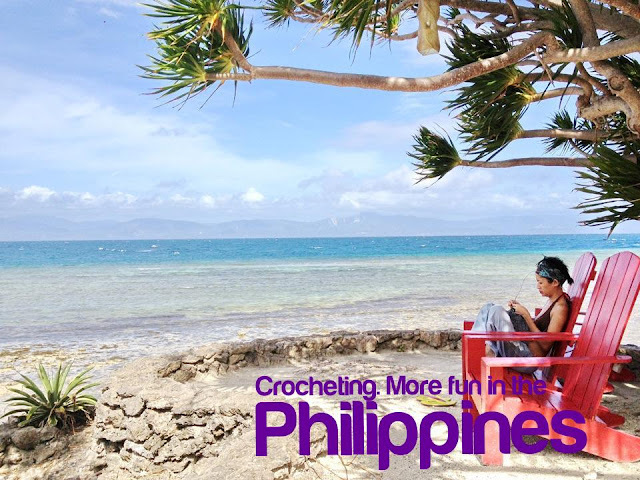 One thing I noticed about my crochet workshops is that we usually get those bouts of silence because of the "alone" time each participant needs to concentrate on her crocheting. Thanks for coming, ladies! 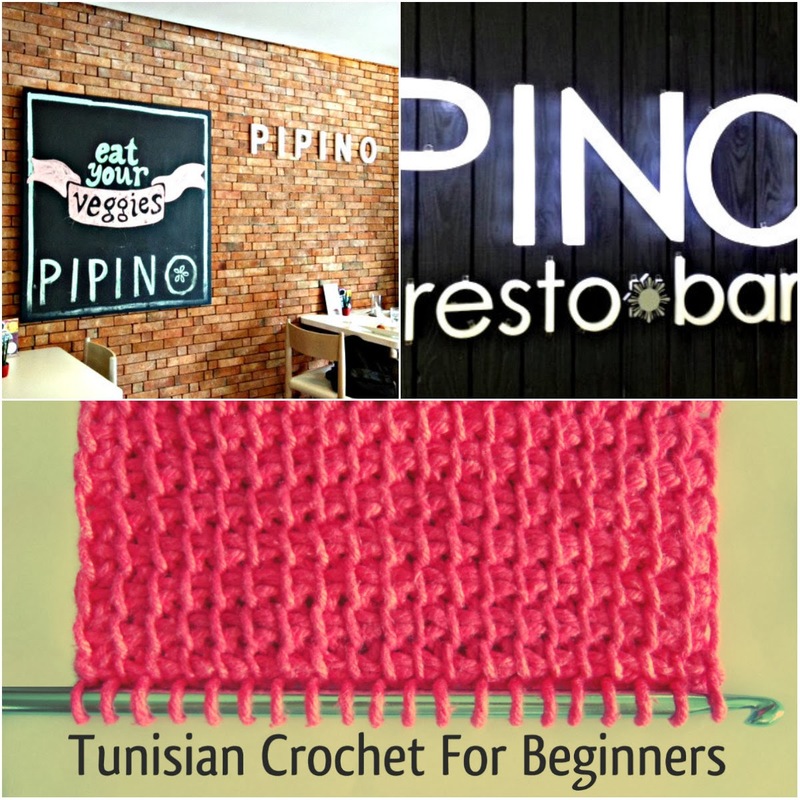 Looking forward to seeing your Tunisian projects (as of today, one of them is actually in the middle of making a shawl using the different kinds of stitches)! If you missed our September workshops, I opened 2 more sessions in October! Workshop fee is P1,250. With this, a participant gets to take home 2 skeins of Creme de la Creme yarn (colors to be chosen by the participant from the stash available), a 14-in. 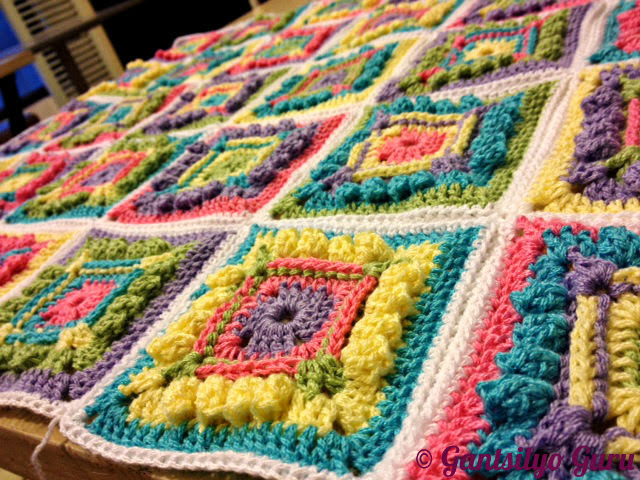 Susan Bates Afghan Hook, and illustrated instructions. Delicious vegetarian food from Pipino will also be served! Just to tease you a bit, these are the color choices of Creme de la Creme yarn available to the participants of this workshop. 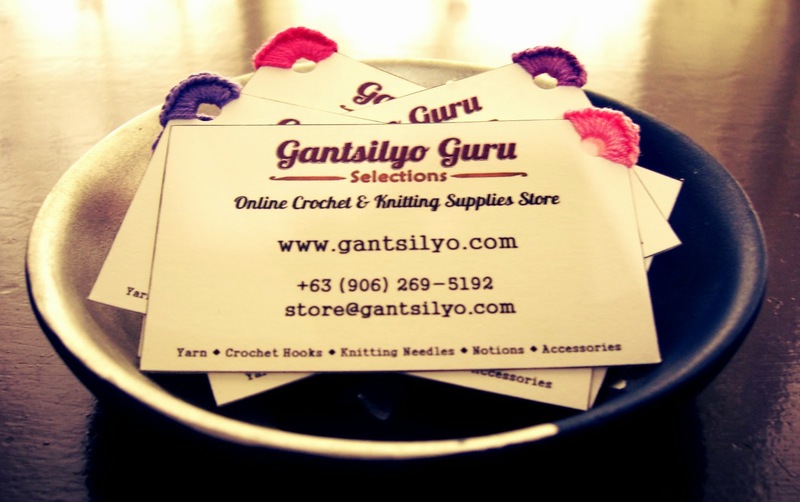 This yarn will also be offered exclusively online by Gantsilyo Guru Selections! I just punched a hole on the upper corner and did some single crochets. I needed to add that "special touch" to my card to make up for its crude design and print. The alternating crocheted corners seem to have a good effect when all cards are displayed on top of each other. 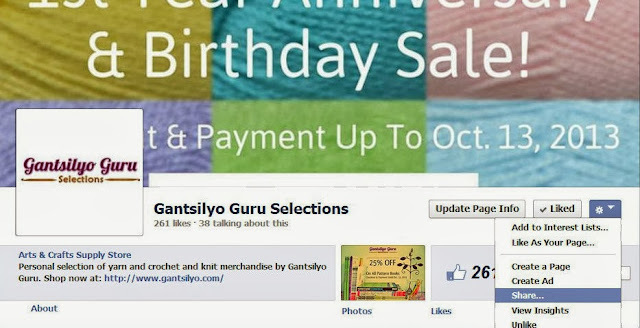 Special Anniversary and Birthday Sale at Gantsilyo Guru Selections! 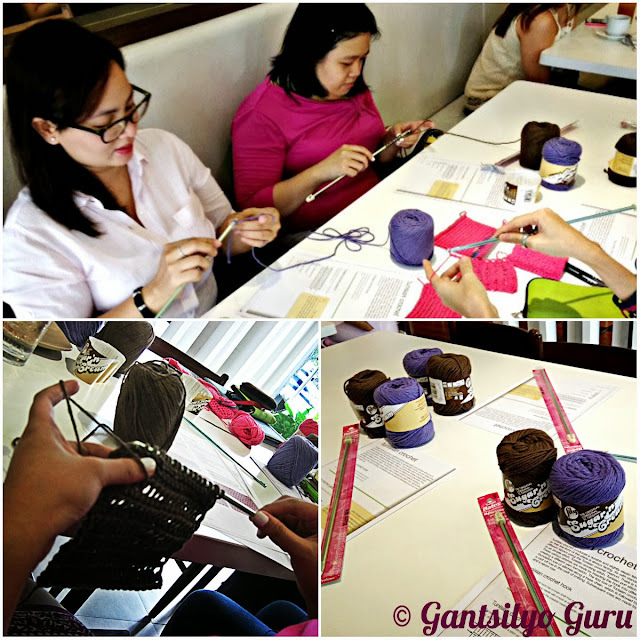 This time last year, I launched my Facebook Page, Crochet by the Gantsilyo Guru. 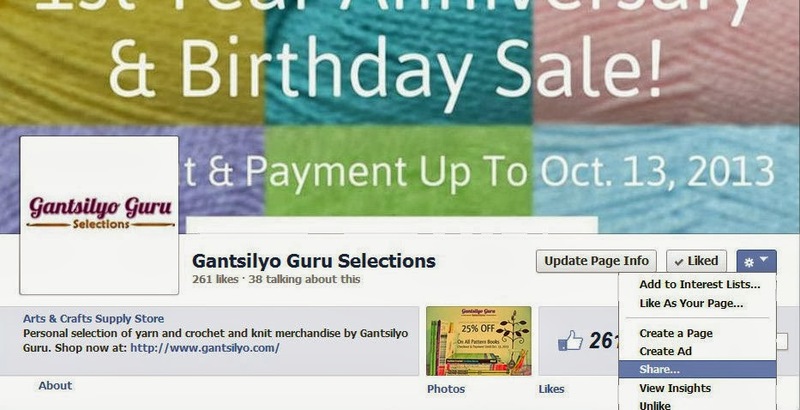 Officially, Gantsilyo Guru is 1 year old! My birthday is also coming up, so I want to treat yarn lovers out there with a special sale of our baby yarn! 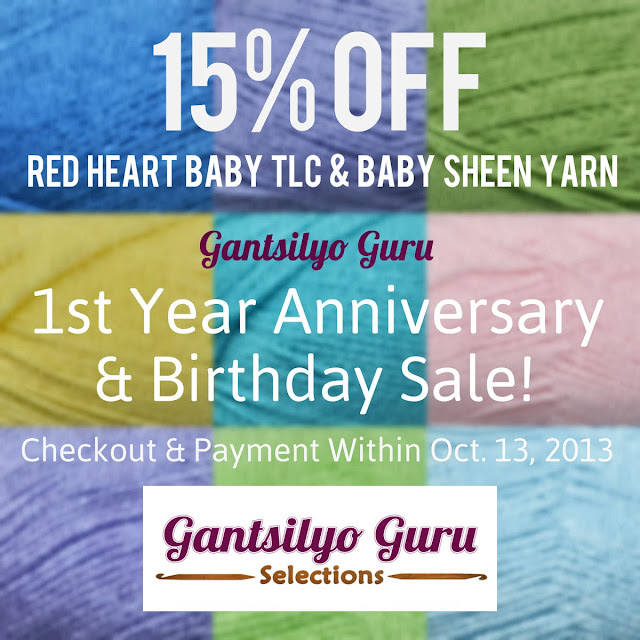 From now up to October 13, all Red Heart Baby TLC and Red Heart Baby Sheen yarn are on sale at 15% off their regular price. Checkout and payment must be made between now and October 13. To find out more about Red Heart Baby TLC yarn, go to this LINK. To find out more about Red Heart Baby Sheen yarn, go to this LINK. It's Confirmed. The Bedspread Is Meant For Someone Now. So last month, I introduced you to the first cluster of motifs for a bedspread I am making (go HERE for the blog entry). I said it wasn't meant for anyone (yet). I did it because I wanted to make one. Well, someone wants it now. And it must be for a queen-size bed! I originally planned it for a double-size bed. I am not complaining. A challenge is always a challenge. I like it when my crocheting "prowess" is challenged. I made an initial cluster, but I decided to make that cluster bigger. Why make an initial cluster? I have this thing for color combinations per motif. The motif placements may look random for this cluster, but they're not. For example, notice the color of the round before the white border per motif? I made sure a motif is not placed beside, below, or above a motif that has the same color for the round I mentioned. This initial cluster will be my basis for the next clusters. Each cluster has 30 motifs. I did the math (yes, math!) and to make a 60-in. x 80-in. bedspread, I need to put together 9 clusters (plus 1 column of 3 clusters). There will be a total of 285 motifs! This bedspread is actually meant to be delivered April 2014. I have a lot of time. Knowing me though, I might finish this before the year ends. I have this fear of not being able to deliver on time and I guess I just want to finish a project the soonest that I can so I can accommodate more. Yarn used for this project is Red Heart Baby Sheen yarn. It is crocheted with Susan Bates Silvalium US F5 hook. This is an adapted pattern from "300 Classic Blocks For Crochet Projects" by Linda P. Schapper. I have 2 firsts in this workshop. It was my first time holding a workshop at Pipino/Pino and teaching with an afghan hook! It was an intimate session. 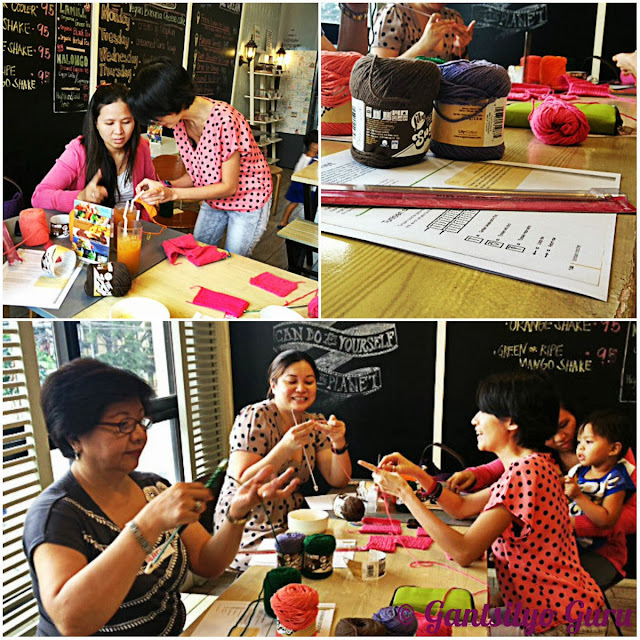 The workshop actually felt like a crochet hangout because we all liked crochet and we had good food from Pipino and Pino. Unfortunately, I forgot to take pics of the food! Since I have another workshop this coming Saturday (September 14) I won't forget anymore! 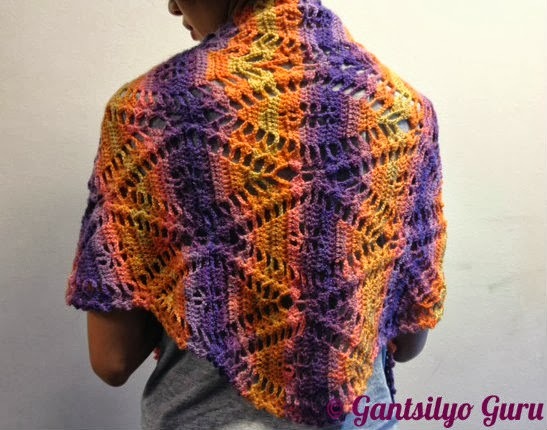 It was a treat working with Lily Sugar 'n Cream yarn. Our goal for the workshop was to make swatches of 4 different kinds of Tunisian stitches. We worked on these stitches on top of one another in a single swatch so we can "conserve" the (very limited) Lily yarn. Yes, it's a rare yarn! They also learned how to change colors. In this workshop, the basics of Tunisian crochet were taught. As I have mentioned in my previous blog entries, crochet (any technique) takes practice. From here, you have to take the initiative to practice on your own and take on different projects so you can improve your "tension" and be confident with your outputs. I actually still have a slot left for the Sep. 14 workshop. You can still register by filling up this form. 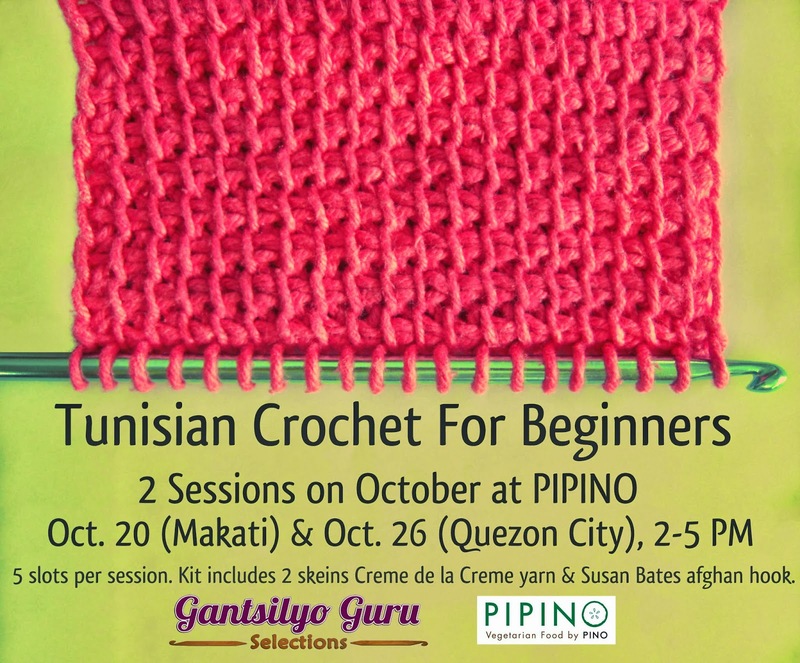 If you can't make it this Saturday, I opened another workshop on October 20 (Sunday) at PIPINO Jupiter (Makati), 2-5PM. You may already register for this workshop by filling up the form below. First Monthsary Sale for Gantsilyo Guru Selections! 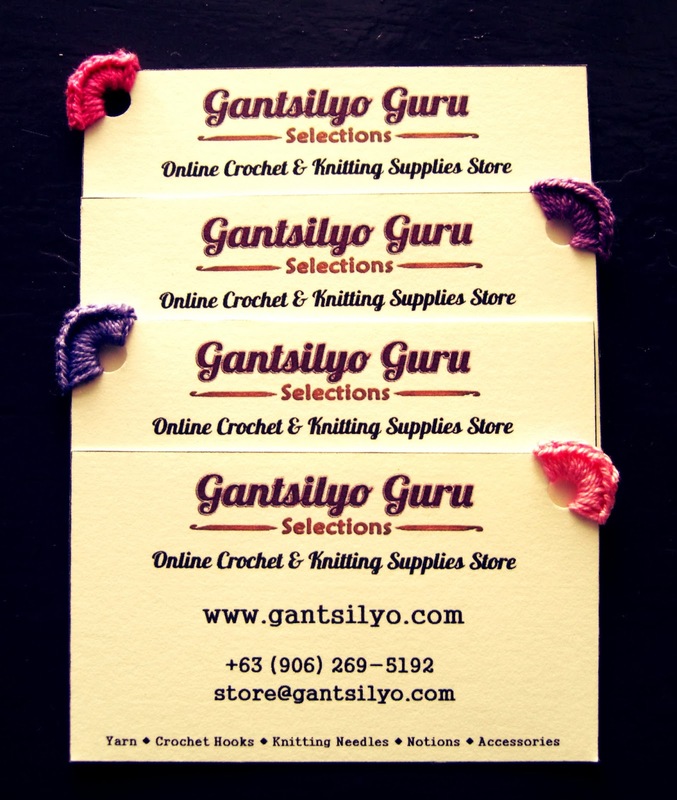 It's almost a month since we launched Gantsilyo Guru Selections! 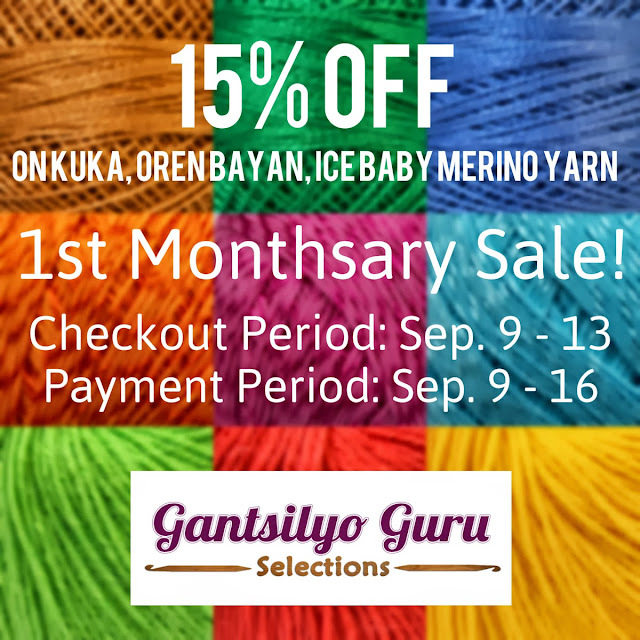 To celebrate our monthsary week, we are offering 15% off on all our Kuka and Oren Bayan yarn and Ice Baby Merino yarn! 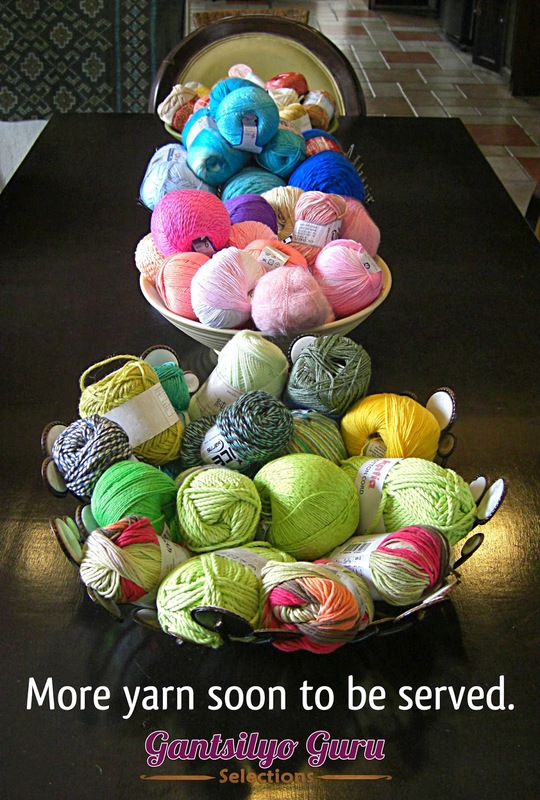 We have many colors for each yarn. Ice Baby Merino (leftmost) is a soft yarn made of wool and cashmere-like polyamide. Kuka Summer (middle) is made of mercerized cotton. 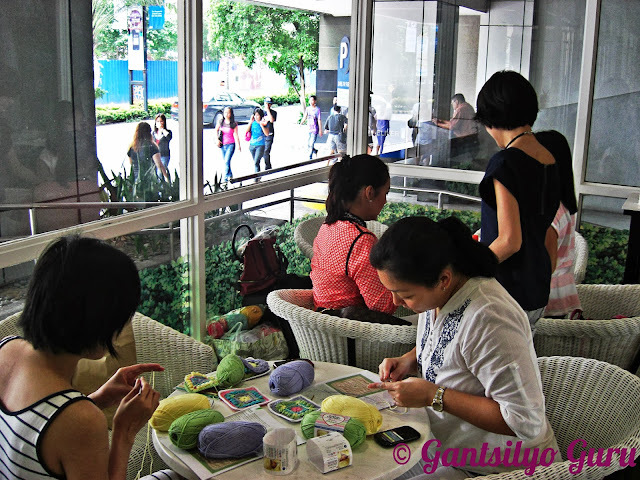 On sale as well is the Coton Perle 8 thread of Oren Bayan (right). 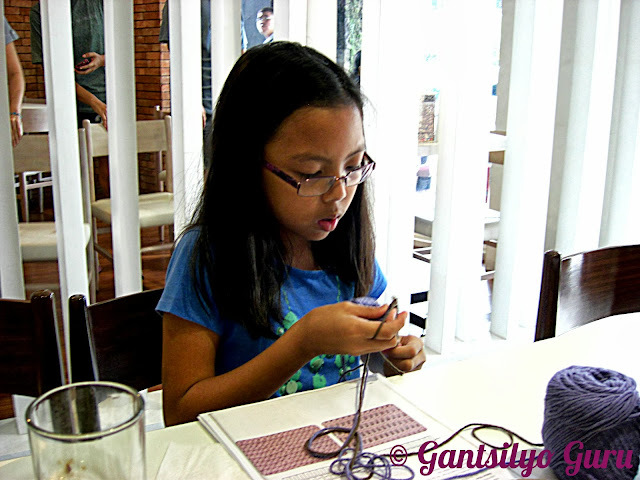 This thread can be used not only for needlework but also to crochet accessories like earrings. These items on sale must be checked within Sep. 9 and 13. Payment must also be made within Sep. 9 and 16 so you may avail of the sale prices. It was a steady Saturday afternoon of crocheting for the second batch of our motif crochet-along with Red Heart Baby Sheen yarn last August 31 at GIGI Coffee & Cupcakes. On paper, the patterns for the motifs looked plain and simple. They didn't stand out. But once you change the colors for each round, the end product becomes more interesting. The participants discovered these as they moved from one round to the next. It also helped that we had so much yarn to work with! Each motif had 5 different colors, so each participant got 5 skeins in varying colors. Raffle Alert! 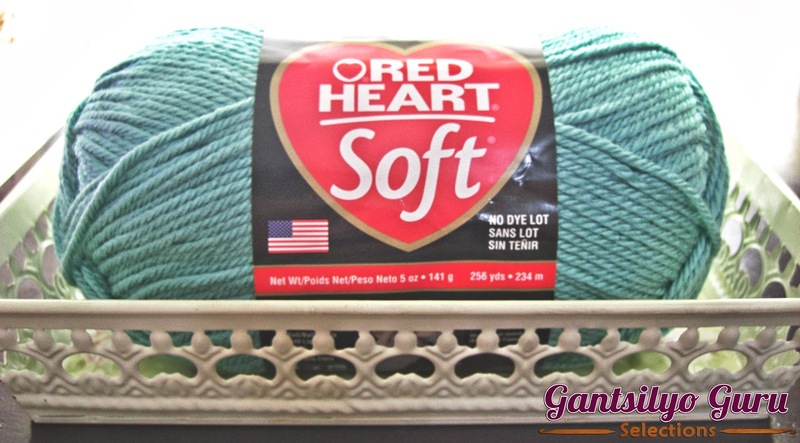 Be One of The First To Have Red Heart Soft Yarn! Here's another raffle! Be one of the first in the Philippines to have your own skein of Red Heart Soft yarn (in Seafoam color)! 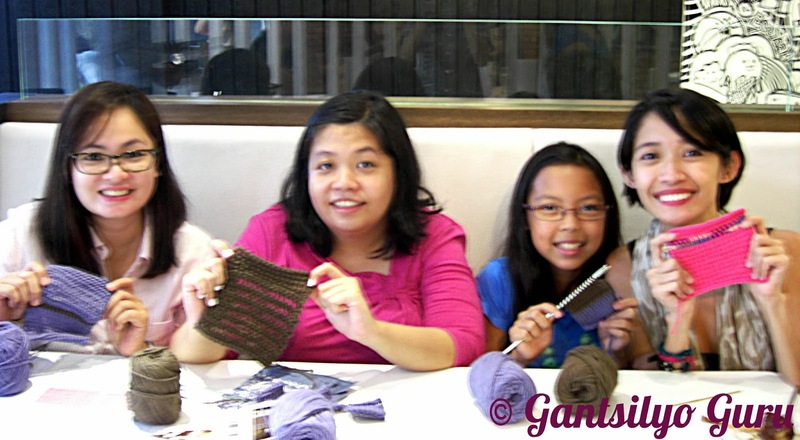 This yarn, by the way, will be available in the country very soon at Gantsilyo Guru Selections! "Elegant drape, subtle sheen, and rich body combined with an ultra soft hand to create an exceptionally versatile yarn. Ideal for knit and crochet projects for the entire family, from apparel to accents for your home." 1. Go to this LINK on my Facebook Page. The link directs you to my workshop poster. 3. Write the text shown below as your post. 4. 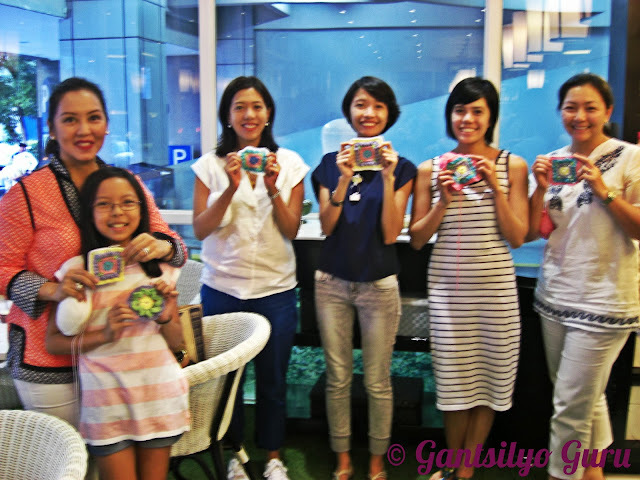 Make sure that "Crochet by the Gantsilyo Guru" is the tagged link to my page. 5. Make sure that your sharing status for this post is set on PUBLIC. To reiterate No. 5, it is important that you set the status of your share to PUBLIC, because this will enable me to see your share. Without seeing your share, I won't be able to include your name in the raffle. Sharing ends on Sep. 28, 2013. A winner will be announced on Sep. 30, 2013. This raffle is only applicable to residents of the Philippines (well, even if you aren't, feel free to share it as well :p).